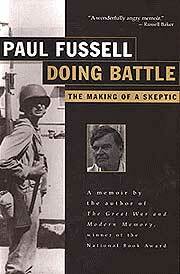 If you're looking for a traditional World War II memoir, look past Paul Fussell’s Doing Battle. This is the exploration of a life, an autobiography, and if you read it, expect to learn about Fussell's family, his experiences in the war as an Army infantry officer, his post-war experiences studying to be an English professor, his academic and publishing career, but most importantly his critical views on post-war "American" culture. Of course, World War II colors the events of Fussell's life in dramatic ways. And his admissions about Army life are surprisingly candid. For instance, Fussell suggests that his company was lazy and often avoided digging in, preferring to sleep on the ground and risk exposing themselves to artillery barrages. He even admits that his own inaction in March 1945 led to the death of a fellow soldier under his command. That event led Fussell down a path few have ventured: of the exploration of ideas as a vocation, and while he wrote other books in his field, he was interested "in the relation between physical violence and terror, on the one hand, and the conventions and limits of language, especially published language, on the other" (264). The Great War and Modern Memory and Wartime are the products of this research. The idea of the "good war" fought by the "greatest generation" is shot to pieces his in literary sights, too, just as men in his company shot surrendering and weeping German soldiers who were pleading for their lives in the bottom of a forest crater. Known as the "Great Turkey Shoot" and retold thereafter over campfires and "transformed into amusing narrative" (124) in his company, 15-20 Germans were shot while GIs were "[l]aughing and howling, hoo-ha-ing and cowboy and good old-boy yelling" (124). Fussell doesn’t condemn his comrades here. Rather he's merely retelling the circumstance of how sometimes Germans didn't surrender fast enough or with enough contrition or that his company was especially hard on "snotty Nazi adolescents" (124). It's all pretty sobering stuff, and Fussell admits that young American soldiers are "'one of the most brutal things in the world'"(124). The main idea coursing through the veins of this Doing Battle is the idea of institutional fraud in its many forms. It's surprising to learn that both the Army and Harvard College after the war were similarly stilted institutions, steeped in chickenshit. Yet there are gracious portraits here of professors who helped Fussell along the path toward a life of exploring ideas. He describes these men as artists, really, each with a unique style enduring enough to find space in his book 40 years after the fact. "[t]he concept of a weekend, so significant [outside the academic world], does not suggest a spacious time for play or unwinding. It means two full days of marking [papers], followed by a full Sunday evening working up to the eight o'clock class for Monday. People who have not taught college English may be surprised to hear that one must reread a work every time one teaches it, at least for the first few years. Until one has taught for some time and amassed folders of old notes, as well as accumulated many texts annotated in their margins with things to say, class preparation is a nightmare of pressure and rushing" (220). Amen, Professor Fussell. This kind of passage is representative of the book and the author's experience. He came up in California, joined the Army, went to college in the east, became a professor and writer. Expect details along these lines. And it's all interesting stuff as well, reading of how he came to write his books and research behind the finished product. For me, Doing Battle is a book I return read every so often as a reminder that a life in criticism (or pursing ideas), in its many forms, is truly worth pursuing.